Sport Suds Washing Machine Cleaner, is suitable for high efficiency (HE) and front loading washers as well as traditional, top-loading washing machines. The non-fragranced, powder formulation loosens and removes soap scum, scale, foreign debris and other growths and washes them away. 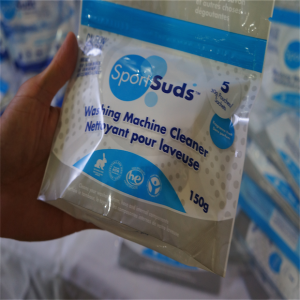 By using a non-residue formulation that focusses on removing contaminants and undesirables in the washer’s drum and internal components, Sport Suds Washing Machine Cleaner effectively eliminates foul odours. Sport Suds Washing Machine Cleaner is eco-friendly, easy to use and exceeds manufacturers’ recommendations for regular, periodic washer maintenance. “During development, it was a matter of examining a typical laundry cleaning process and understanding how contaminates were introduced and removed from clothes. We discovered that one of the largest culprits were dirty washing machines that, in the worst cases, soaked clothes in wash water tainted with mould and algae..”, reports Paul Yung, president of Sports Suds.